The front half of the field about to start the race. Note that several FISCAR cars appear well up the order - 3 of the Lotus Elites and the very identifiable outline of Andy Sharp's Aston Martin DB2. Keeping track of 'our' cars amidst this large field was always going to be tricky particularly after the pit stops and I am drafting this report a month after it took place so, by necessity it will be more than usually perfunctory. However, it was clear that Andy Sharp was not going to have it his own way with both Ellis and Freeman getting by during the first part of the race. In addition, Andy was embroiled at various stages in a battle with the Chevrolet Camaro of Savage and Murphy, the later HRS big V8 car having by far the greater 'grunt' on the straights and usually ahead of the Aston. Nigel Grice's Austin Healey briefly ran well but the misfiring which had dogged his practice returned and he retired after completing just 3 laps. Whilst the Lotus Elites of Mike Freeman, Robin Ellis and Jonathan Smare had joined Andy Sharp's DB2 to take the battle to the HRS cars in the top half of the grid, our other cars were just as embroiled in battle further back with Marc Gordon gaining the upper hand of this group, in his XK150. Sadly, the other Jaguar of Nick Wilkins joined Nigel Grice in retirement, the performance of the XK120 well below par. David Cottingham soldiered on in the beautiful Ace Bristol despite his gear selection woes. He was eventually to finish 28th but had sufficiently improved on his seeding to help the Healey Hounds of which he was an honorary member for the day, to win the Team handicap. At the pit stops, Andy Sharp emerged at the front of our cars although I noted that he had followed the Robin Ellis Elite into the pits. However, he finished over 20 seconds clear of Robin, with the Elite of Mike Freeman sitting between them. Including the Elite of Jonathan Smare then, our top 4 cars finished 9th, 10th, 11th and 13th overall in this race against the later cars, so a pretty impressive result. 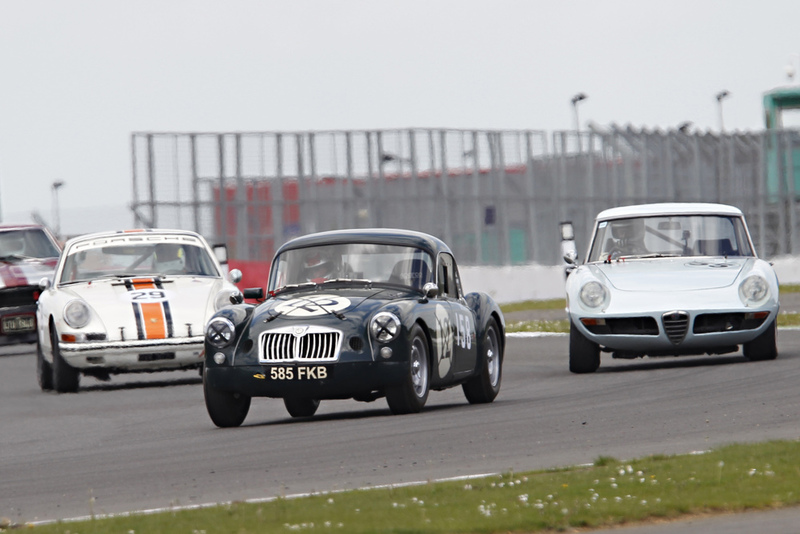 The Tollett, Father and son team brought the MGA Sebring home just 2 seconds behind the Tim Stamper Aston and the ever enthusiastic Matthew Collings chased David Cottingham's AC home in his Austin Healey 100M. He declared it one of his most enjoyable races, and you can't say fairer than that.